The American Bulldog is a descendant of a generic bulldog type of dog breed brought into the region that is now the Southern United States by working-class immigrants many years ago. These were all-around working dogs used by small farmers and ranchers for several tasks around the farm. They were often found working as catch dogs, stock dogs, and overall farm guardians. When feral pigs were introduced to the New World, they had no natural predators and the population quickly grew out of control. In addition to their farm duties, the settlers found the bulldog-type dog to be the best solution they had for dealing with it. So, the bulldog continued to thrive, especially in the South. The breed was near extinction by the time World War II began and it is thanks to the efforts of John D. Johnson and Alan Scott that we have what we know today as the American Bulldog. Modern American Bulldogs can still be found working as all-around utility dogs, farm dogs, catch dogs, cattle drovers, and more. They can also be found competing in dog sports, working as a guardian, police, or military dog, and are also popular as a family pet. This dog breed is a sweetheart with a gentle, fun-loving nature. The American Bulldog is affectionate and adores their families. They also love children and tend to be good with other animals. American Bulldogs can have a high prey drive, so you will want to make sure you introduce and socialize them properly with other small animals in the household. Due to their protective nature, they can be aloof towards strangers and strange dogs, especially when they are younger. Early socialization can help them be more comfortable navigating their guardian instincts. Overall, this dog breed tends to be confident, social, and are most at ease and relaxed when they are with the people they love. American Bulldogs are an emotional dog breed and thrives on human attention and affection, so they tend to bond strongly with their owners and may come across as clingy sometimes. They will also often convince themselves that they are lap dogs regardless of their size, so make sure you are ready for a lot of love and cuddles with your American Bulldog, drool and all! The American Bulldog is a moderately adaptable dog breed. They are strong, high-energy working dogs that love being around their favorite humans. This makes them better suited to larger homes with space for them to run. They are not generally a good fit for apartment living, but they can adapt as long as they get more than enough exercise and attention. Because they do tend to bond strongly with their owners and want to be near them, they do not tend to do well with long periods of time alone. As with any dog breed, they are sensitive to extreme heat or cold, but can adapt to well to most climates. There are some health issues that can be found in specific genetic lines and are not common to the breed overall, but these can be ruled out with genetic tests. Some potential health conditions to be aware of in general with the American Bulldog include hip dysplasia, elbow dysplasia, thyroid disorders, kidney disorders, bone cancer, and eye-related issues like ectropion, entropion, and cherry eye. Talking to the breeder about the genetic history of the parents and asking to see any health clearances can help allay potential concerns. American Bulldogs are highly trainable and eager to please, so they are a good fit for owners of any experience level, including first-time dog owners. They can have a stubborn streak, so a first-time dog owner may want to consider enrolling in puppy training classes. 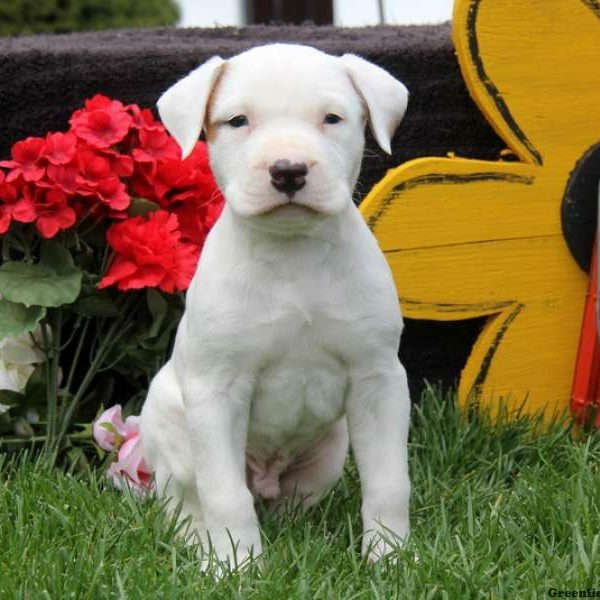 As with any dog breed, early and ongoing training and socialization are important for your American Bulldog puppy to grow into a well-rounded, and a well-behaved, dog. This dog breed has a short coat that is generally smooth. Common coat colors are white and predominately white with patches of brindle, black, or red. More coat color patterns are emerging and becoming more common like all shades of brindle, fawn, brown, red, and more. The American Bulldog is relatively low maintenance and easy to groom and they are light to moderate shedders. They only require a bath as needed. But, you will need to be prepared to deal with some extra drool! In addition to coat care, you will also need to care for your dog’s nails, ears, and teeth. Usually, a monthly nail trimming is sufficient to keep your dog’s nails from getting too long. They may need a trim more often if their nails aren’t wearing down as quickly on their own. So, keep an ear out for any sounds when they’re walking across a hard surface. If you hear their nails clicking against the floor, then it’s likely time for a nail trim. It’s also important to check your dog’s ears regularly and carefully clean them as needed. When you check your dog’s ears, you want to make sure they are dry, clean, and free of debris. Floppy ears tend to trap moisture and dirt, which can lead to ear infections. Taking care of your dog’s teeth is also important to help prevent gum disease and tooth decay. The ideal dental care for dogs is using an enzyme toothpaste or brushing their teeth every day. Dental hygiene chews or treats, a specially-formulated dental care diet, and more can be used to supplement your dental care efforts. The American Bulldog is an athletic and high-energy dog breed. They love daily walks and plenty of playtime outside. They may even enjoy plenty of other activities with you like swimming, hiking, and more. With their working dog background, this dog breed does need a job to do in order to stay happy and healthy. 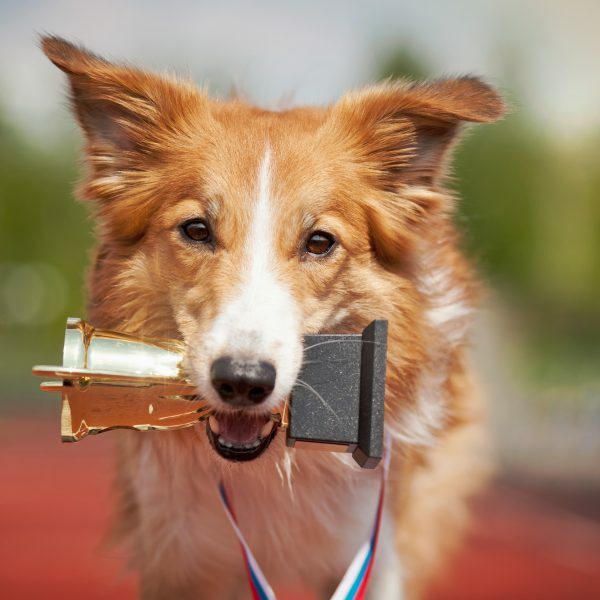 They also tend to be a good candidate for dog sports like obedience, weight pulling, the Iron Dog competition, and more. A fully-grown American Bulldog usually stands 20-27 inches tall at the shoulder and weighs between 60-125 pounds. An American Bulldog generally lives 10-16 years. Chance, one of the canine stars from the Homeward Bound films, was an American Bulldog. An American Bulldog was also featured in the 1994 remake of The Little Rascals as Petey and as the family pet in Cheaper by the Dozen. Dogs from TV shows and movies can make us smile, laugh, cry, and wish for a dog of our own. These are the dog breeds of 13 famous dogs. The American Bulldog is a working class breed of dog with an interesting personality. They are at ease with their family, and love lots of attention. They are a strong, muscular breed with a smooth coat. This diverse canine is a capable watchdog, or a loving family pet. They will enjoy an active lifestyle and love to exercise. They are also used by some to hunt boar, and also to drive cattle in some cases.